An hour spent in the company of St Vincent, might be a salutary lesson in the artistic power of niceness. On an early Sydney evening a slight and elfin figure in a cocktail dress addresses calls for an encore with "Holy cow, you're very sweet". Annie Clark, the one woman that is the band St Vincent, is neither whimsical nor kooky. You sense that her music is serious in intent, but her politeness and humour suggests that she doesn't take herself as seriously as she does her art. And that, dear reader, that lack of posturing, the obsession with what she can do with words and noise tells me why such a short time produces a more moments of transcendence than a those angsty boys posing through their angsty gigs, with their angsty clichés of cool. Her music's not always easy to describe, for the most part it's her and a drum synth, although for one romantic ballad she takes to a grand piano. The songs are in a literate folkish chamber pop register but that does so little to actually describe the noise that comes from the stage that it's meaningless. In a moment she's crackling a line of bluesy torchsong through a 40's microphone, striking a new beat into life from her sequencer and slashing a metallic clatter of guitar across the ballad she sings in a firm but sibilant voice. The diffuse evening light of the Spiegeltent is the perfect festival venue for her, as her songs take in everything from doo-wop interludes, through hints of chanson and cabaret to a metronomic beat that would have felt at home on the 4AD label in the eighties. 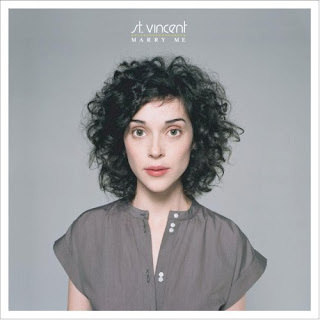 I like St Vincent very much, she's so much better in the china pale flesh than on her debut album, 'Marry Me'. Both sets contain the same songs but here, in the round, they benefit from no production, their constituent parts jut out clean and clear and she never runs the risk of sounding like anyone else. And that's what makes St Vincent great, it's easy to see parallels in other art pop women, but each song has a life of its own and enough facets to make comparisons invidious. 'Paris Is Burning' reels in a circus polka, 'Marry Me' is a tender piano lovesong whilst 'Human Racing' swings between scattish poetry and big rasps of guitar. To hear something so determinedly of itself, so enamoured of the way sounds and words share secrets in unexpected rhythms is the last thing one expects today. Cast St Vincent against the legion of leaden eighties electro pasticheurs and you realise just what a gift she is. When she does deliver that gift in her encore she say "This is another lovesong, but don't worry. It's also sardonic". I don't think we were ever worried.